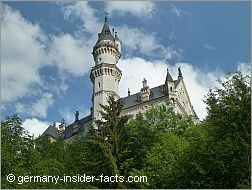 Stay at the historic Schlossrestaurant Neuschwanstein Hotel, you can't sleep closer to the famous castle. From here it is only a very short walk to the entrance of the castle. Built to host and feed the workers and constructors of Neuschwanstein castle, modern-day visitors can enjoy hospitality at a beautiful location. 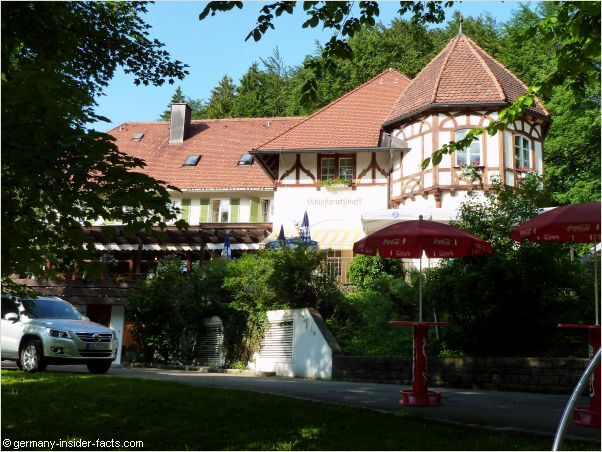 This hotel is your best choice if you want to visit Neuschwanstein castle, provided you have your own car, or don't mind to pay the taxi fee from Hohenschwangau. 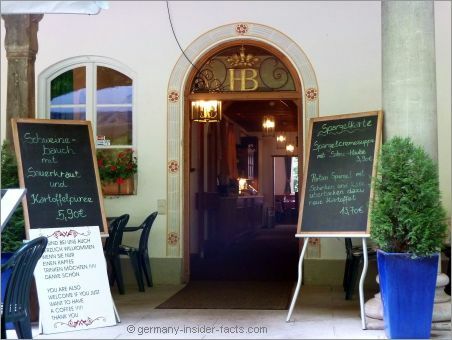 If you don't have much baggage, you can also use the horse carriage from Hohenschwangau which stops right at the front of the Schlossrestaurant. Hotel guests have the huge advantage to get a permit to drive up the road that is closed for all other traffic. However, keep in mind that the drive to the hotel might be very slow due to the horse carriages and visitors on the road. Drive carefully and with patience. Just in case you are wondering how else (if you are not a hotel guest) you can reach the castle, here is how you get to the palace. The hotel is a listed building, steeped in history, and offers great atmosphere. Enjoy excellent hospitality and superb views of the alps and the castle while you walk around. The hotel offers 8 individually furnitured rooms, some have ensuites while others share the very clean facilities at the corridor. Pets are allowed at no extra costs. Free cots available, children up to 6 years don't pay in the parent's room. Check-in is from 2pm to 6pm, latest check-out is 11am. Please note that the hotel is not attended after 6pm. When you arrive later, get in contact with the hotel to make arrangements. The hotel is generally closed on 23.12, 24.12, 25.12, 30.12, 31.12, und 01.01. Prices are fairly reasonable for this outstanding location and depend on the room and season. Click here to check availability and make your booking. The restaurant is the place to meet other travellers during the day. Relax on the veranda with a coffee and a piece of yummy German cake, the view to the castle is included, or dine in one of the guest rooms of the restaurant. Choose from a wide range of international and typical local dishes like Käsepätzle, pork, sausages and Sauerkraut. 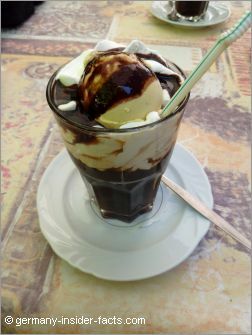 Leave some room for the mouth-watering dessert, or a scrumptious ice-coffee (Eiskaffee). The restaurant is open from 9am to 6pm in summer and from 10am to 5pm in winter. 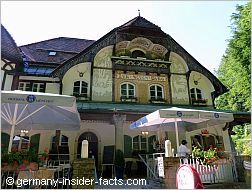 Restaurant guests who don't stay at the Schlossrestaurant Hotel cannot drive up by car. Are you convinced this is the place to go? Have a wonderful stay at this unique place.